Heart failure is the inability of the heart to pump blood in sufficient quantities to meet the networking needs for nutrients and oxygen. The fundamental mechanisms of heart failure, including damage to the contractile properties of the heart, leading to cardiac output is less than normal. Common underlying conditions including atherosclerosis, atrial hypertension, and inflammatory or degenerative disease of the heart muscle. A number of systemic factors to support the development and severity of heart failure. Increased metabolic rate (eg, fever, coma, tiroktoksikosis), hypoxia and anemia requiring an increase in cardiac output to meet the need of oxygen. In developing countries, the most common cause is coronary artery disease leading to myocardial infarction and non-functioning myocardium (ischemic cardiomyopathy). The most common cause is an alcoholic cardiomyopathy, viral myocarditis (including HIV infection), and dilated cardiomyopathy with no definite cause (idiopathic cardiomyopathy). Hypertension remains a cause of significant congestive heart failure. Besides heart valve disease is also a cause of heart failure, but now somewhat rare heart valve disease leading to heart failure. Aortic stenosis remain common causes and can be corrected. 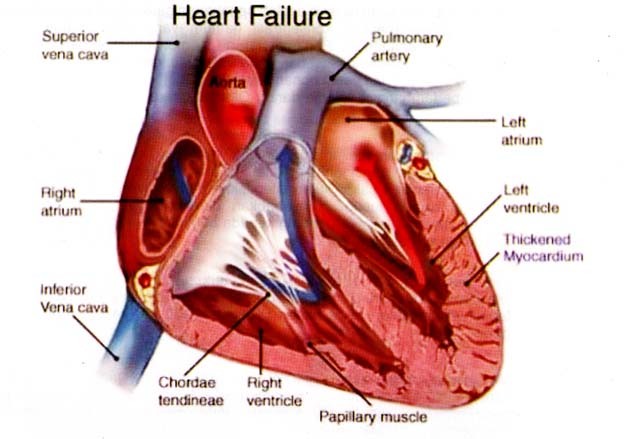 In case of heart failure, the body has several adaptations in both the heart and systemically. If both ventricular stroke volume is reduced due to suppression of contractility or afterload was increased, the volume and end-diastolic pressure in the two chambers of the heart increased. This will increase the length of myocardial fibers end-diastolic, systolic rise time becomes shorter. If this condition persists, ventricular dilatation occurs. Cardiac output at rest but can still be good, but the increase in diastolic pressure that lasts longer / chronicle will spread to both the atrium and the pulmonary circulation and the systemic circulation. Finally, capillary pressure will increase which will lead to transudation of fluid and edema arising systemic or pulmonary edema. Decrease in cardiac output, especially if associated with a reduction in arterial pressure or decreased renal perfusion, will activate several neural and humoral systems. Increased activity of the sympathetic nervous system will stimulate myocardial contraction, heart rate and veins; recent changes that will increase blood volume sentral.yang further increase preload. Although these adaptations are designed to increase cardiac output, adaptation itself can interfere with the body. Therefore, tachycardia and increased myocardial contractility can stimulate the occurrence of ischemia in patients with coronary artery disease earlier and increased preload may worsen pulmonary congestion. Activation of the sympathetic nervous sitem will also increase peripheral resistance; adaptation designed to maintain perfusion to vital organs, but if activation is meningkatmalah will reduce flow to the kidneys and tissues. Peripheral vascular resistance may also be a major determinant of ventricular afterload, so that excessive sympathetic activity can improve the function of the heart itself. One important effect is a decrease in cardiac output decreased renal blood flow and filtration rate decreased glomerolus, which will cause sodium and fluid retention. Sitem renin - angiotensin - aldosterone system will also be activated, leading to increased peripheral vascular resistance and a subsequent increase in left ventricular afterload as sodium and fluid retention. Heart failure is associated with increased levels of arginine vasopressin in the circulation increases, which also is vasokontriktor and inhibiting the excretion of fluids. In heart failure increased atrial natriuretic peptide due to increased atrial pressure, which indicates that here there is resistance to the effects of natriuretic and vasodilator.